Parks for Cash melt-down in Milton Keynes. A win for the people but big threat remains. 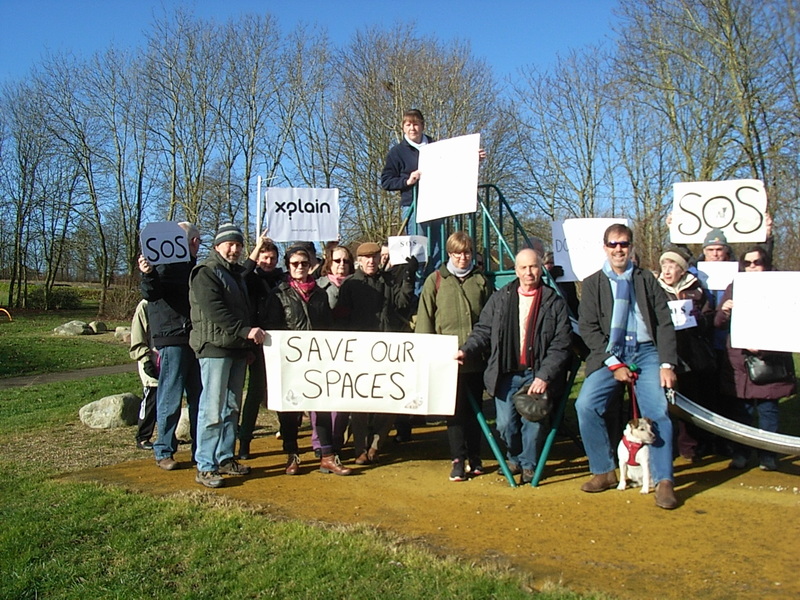 Faced with furious residents, bad publicity and united political opposition, the cabinet of Milton Keynes Council finally agreed at a full Council meeting on 25 March to revise its controversial proposals to build infill housing on green spaces. But the threat remains and there is new evidence that the 60 or so sites listed in the controversial ‘Site Allocations Plan’ is just the tip of a powerful iceberg. Xplain has discovered that, without involving ward councillors, parish councils or – of course – the residents most affected – officers have already earmarked an additional 160 sites across MK as further ‘development opportunities’. A few are brownfield sites but many others, such as parks in Woostones, are not. Worried about a green space near you? You should be! Read on for some frequently asked questions. All the answers are based on information Xplain has dug out, by attending Council meetings, scouring reports and direct inquiry. Q: What’s this controversial ‘Site Allocations Plan’ (SAP) all about? Q: But isn’t this is a drop in the ocean? MK is full of building sites! A: Correct. According to a recent Council blurb, MK will proudly deliver “28,000 new homes in the next few years”. In another bit of good news, the Council announced they had received a reward of £10.6 m from central government for its annual New Homes Bonus (up £2m from the year before). Q: Surely the Council can find enough brownfield sites to house the ‘missing’ 1,000 homes? A: Indeed it can. The first SAP (completed Sept 2014) earmarked enough space for 3,000 homes. None of them were Council-owned playparks or other open spaces of the kind they subsequently went on to list. However, just a few days after the first list had been completed the Council offered up a slice of its own landholdings for a second list, amounting to space for another 8,000 homes! Q: So why did MKC suddenly throw all these controversial sites in the pot? Q: So the Council had no need to put any of these green spaces forward at all! A: Correct. It simply chose to do so. Even though it immediately jeopardised the peace of mind, quality of life and property values of hundreds of residents, and, if adopted, would set a precedent for selling off similar sites throughout MK. Q: There must be some reason for putting people through all this stress. A: Simple incompetence? Or a cunning plan to turn liabilities into assets?After all, selling off the equivalent of village greens for infill housing would not only cut Council landscape maintenance costs but also put cash in the bank. Q: I don’t live near any sites listed on the second Site Allocations Plan, so why worry? A: Because this is the tip of the iceberg. If they can get away with it this time, in Stantonbury and Springfield, they can get away with it anywhere. A: The hidden part of the iceberg is the innocent-sounding ‘Land Categorisation’ project which covers the entire borough. Several years ago this began as a sensible stock-take of all Council owned land. However at some point it has morphed into a dangerous ‘policy’ to earmark sites for potential sale; a policy pursued without a public mandate, without transparency and without common sense. Parish by parish, green space and even busy car parks have been picked off as potential development sites. Officers have got their crayons out and coloured in the maps! But none of these maps has been discussed with ward councillors or parish councils – even the ones busy producing Neighbourhood Plans. Xplain has seen three of these multi-coloured maps and, after pressing for their release, was assured by MKC on March 31 that all of them would be published on the Council website. As of 16 May, they are still behind wraps. Why has Milton Keynes Council been pursuing an unofficial policy to sell off so much of the public’s green estate, in a much-loved City of Trees, with no public mandate? This entry was posted in 20th C architecture under threat, Destruction of CMK, garden cities, General, Milton Keynes, Neighbourhood Plans, trees at risk in Milton Keynes, urban planning and tagged MK City of Trees, MK Council, Open green space, Site Allocations Plan, Urban Planning in Milton Keynes on March 31, 2015 by xplain. Any developments on this story, are they still plotting. Reading this I was thinking purpose many of those sites could be transferred to a local Community Land Trust for that area, to protect the green spaces? See other posts re ‘slums of the future’ and ‘labour leader defends explosive study’. Chaos continues!